The following comes from a Jan. 11 story by Anne Hendershott on the website of Crisis. In many of California’s largest cities, pets are replacing people. In a recent article, “San Francisco Asks: Where Have All the Children Gone?,” the New York Timesreports that the City by the Bay has the lowest percentage of children of any of the largest 100 cities in America. 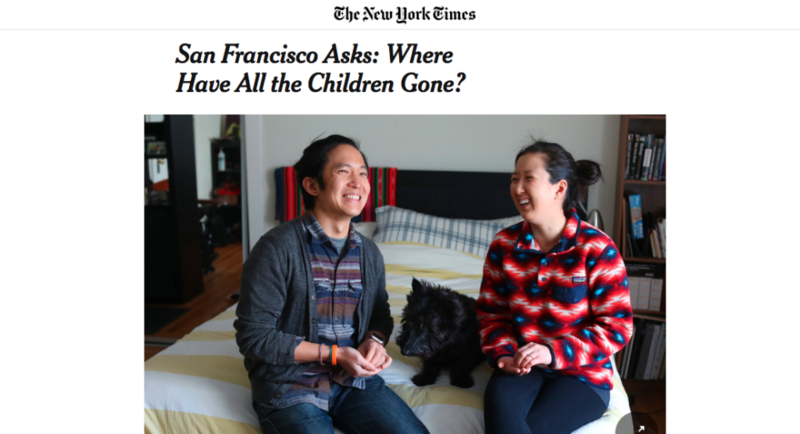 The article introduces a young San Francisco couple: “in a compact studio apartment on the fringes of the Castro district where a young couple live with their demanding 7-year-old whom they dote on and take everywhere: a Scottish terrier named Olive.” Last year the percentage of children in San Francisco fell to 13 percent—even lower than New York City with 21 percent. For an increasing number of couples, pets have moved in to take the place of the children they have chosen not to have. Pampered pets are achieving ever greater status—and protections. California is just the most recent state to provide legal protections to pets involved in divorce custody cases by allowing courts to decide their “best interests.” Pets can even have their own court-appointed attorneys. According to research at Michigan State University’s College of Law, 32 states, Washington, DC, and Puerto Rico have enacted legislation that includes provisions for pets in protective orders in domestic violence cases. The Animal Legal Defense Fund, which just released its 12th annual report ranking the strength of each state’s animal protection laws, reveals that more states are granting legal protections to pets. There is a growing movement now in Rhode Island and other states to redefine pet owners as the less proprietary “pet guardians.” In some ways, it is just another step toward endorsing personhood for pets. While it would appear that veterinarians might be part of promoting the pets as people movement, the American Veterinary Medical Association is actually fighting the idea of legal personhood for pets. The veterinarian’s association is concerned that the movement in some states to redefine pet owners as “pet guardians” could diminish the relationship between pets and owners. Advocates of pet guardianship, such as the animal rights group In Defense of Animals, claim that “owner” overemphasizes the property status of animals. Yet the veterinarian group maintains that if pet “guardianship” were eventually defined along the same lines as guardianship for humans, then pet owners might be limited in choosing from among various health care options for their pets. Moreover, veterinarians could be placed in the difficult position of trying to determine who is ultimately responsible for owners’ decisions regarding pet care…. If couples are having dogs rather than human children, it’s only a matter of time before the “mother” and “father” of the pet will want to be known as transpecies. Stay tuned. The society is now very very sick……it might even be on life support. You even see them listed in the obituaries. How sad! Court appointed attorneys ? This does not surprise me at all. The current Governor is considering taxing drinking water. That should offset the taxpayers expense to provide animals with legal advisors, ridiculous. Helen wheels: love your comment! LOL! It’s just a matter of time before someone sues to be able to marry her pet. (Yes, I predict it will be women who spearhead that movement.) And San Francisco will probably issue marriage licenses to human/animal unions. Now please let me get this straight……..babies in the womb are NOT PERSONS………but DOGS ARE?????? My Grandmother had 14 children in the City of St. Francisco, my Mom was the seventh child, and I would not be be alive if my dear Grandmother had aborted my Mom. It is fairly common place in my observation. Not in young couples either. But, older couples and singles too. Folks who claim they are “dog moms” and take days off from work to mourn the deaths of their pets. This article is highly distorted! It does not give the whole story. Housing in San Francisco is too expensive– a million dollars for an average family home! A couple thousand dollars a month, for an average apt.! Plus, San Fran. is not a good place to raise a family! Most married couples move to nearby communities, to raise families– and commute to jobs. Regardless– responsible pet adoption is always a great idea! keith petersen, I have never heard of the term, “dog mom.” But I know a lot of mothers, who love animals, and teach their children to properly care for the family pets! When a beloved animal dies, grieving people need a hug, and lots of love! Some people who live alone (especially the sick, the elderly, the disabled, etc. )– may have only their beloved pet, for companionship!– and it is too devastating, when their beloved animal friend dies! The SPCA offers Grief Groups for pet loss, which is wonderful! Animals are innocent– and give people unconditional love and support! They should never be pitted cruelly against selfish couples who refuse to love and bear children! Every dog I’ve ever known thinks they are a person. They also have the ability to train their human companions. Jesus died for your cats and dogs!